Although it might strike an audience as unbelievable, but some of the story of Mohsen Makhmalbaf’s “The Silence” is actually a recollection of his childhood. While he is not blind, he certainly recalls being blind to other forms of expression and joy in the world, most of all music and movies. Branded as sinful by his grandmother, Makhmalbaf recalls not having stepped foot inside a cinema until he was in his late teens. However, he eventually encountered music much by chance, and like the protagonist of the second part of his “Poetic Trilogy”, it was Ludwig van Beethoven’s iconic notes which enchanted him. In interviews, Makhmalbaf often claims the films of the “Poetic Trilogy” are essentially works about the art of cinema itself. While “Gabbeh” focuses on sight and visuals, “The Silence” is a film about sound and music. Ironically, this approach towards cinema and the rich Iranian culture is also what resulted in his films being banned for many years in his home country as their overall richness and tendency towards Sufist philosophy obviously struck a chord with censors. For a man who once was a political hardliner and activist himself, this development must have been quite astonishing, but it certainly emphasizes the kind of artist and man he has become over the years. In a country largely dressed in black and brown tones, the sheer audiovisual exuberance that defines “The Silence” and “Gabbeh” almost logically must be regarded as an act of rebellion or revolution. Khorshid (Tamineh Normatova) is a blind young boy who lives with his mother (Golbibi Ziadolahyeva) in a remote house outside of town. To make ends meet, he has a job tuning instruments for a local shop owner and manufacturer. During his daily routine, he is accompanied by Nadareh (Nadereh Abdelahyeva) who is the daughter of the shop owner and a close friend to Khorshid. As their land owner threatens to evict them, his mother urges Khorshid to help her, do his best at his job and maybe ask for an advance. However, while her son wants to support her, he finds himself one day being distracted by a wonderful sound he has heard for the first time. He follows the music, and later on many musicians through parts of town, losing his way as a result and angering his boss. But even with cotton in his ears to protect him from outside influences and concentrate on his work, Khorshid is unable to forget the wonderful music he heard which suddenly has become his world. In many ways “The Silence” is a true companion piece to “Gabbeh”, just as its director has explained in many interviews. Superficially a minimalist story, “The Silence” offers deep insight into Iranian culture and perception, thus creating a unique world which, as author Negar Mottahedeh writes, frequently blurs the lines between what is real and what is not. 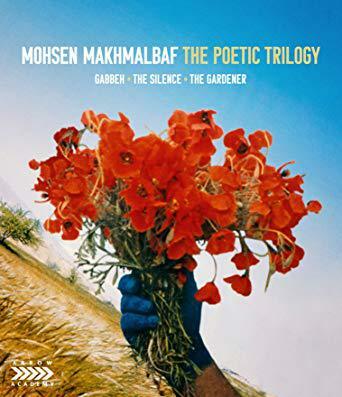 Whereas “Gabbeh” blended reality, history and fiction, in “The Silence” this distinction is suspended by the blindness of the main character whose world is defined by his interpretation of sounds. Naturally, music has to be a similar entity like the colorful carpet was to the character in “Gabbeh”: a world which is at the same time fascinating, beautiful as well as terribly confusing. Perhaps the most profound revelation comes after the viewing experience, as you find yourself questioning much of what you have seen. Since your interpretation depends solely on Khorshid’s way of experiencing the world through sound, images thus have become deceiving, and sounds carry not only much more meaning but are fundamentally influenced by the character. For example, the overall situation of Khorshid and his mother is rather dire with financial pressure coming from their landlord and their general state of isolation outside of town. However, the world shown in the film – which, of course, is the world the boy experiences – is one bearing no connection to these everyday sorrows. It might be unfair to state Khorshid is ignorant of them, but given his perception of the world, he has chosen one which does not allow the negative. In this context, the meaning of music becomes increasingly significant to the viewing experience. Following the metaphor of the carpet of “Gabbeh”, the stream of sensory impressions from the outside is similar in many ways, even telling a story following the same formal structure as with the first film. Like music, rhythmn and experimenting with time is evident in some of the abrupt, rather confusing cuts showing the sleeping Khorshid lying on the shore and in the next shot covered with leaves. Needless to say the images of Ebrahim Ghafouri and the sound design by Behrooz Shahamat emphasize the character’s approach to the world. Like with “Gabbeh” you will certainly feel elevated by the poetic nature and beauty offered in this film presenting music as not only a key to the world, but a key to the individual. At last, the act of coming up with your own symphony of life is an act of freedom unique in each life. “The Silence” is a beautiful film about music and approaching the world as well as interpreting it. Supported by a great cast, wonderful images and music, this is a true film for cinephiles in search for an experience rewarding those with open minds and hearts.